Like most of the world, I was pretty tired on Monday as I stayed up late on Sunday night to watch the coverage of Osama Bin Laden’s death announcement. I was so tired that I even overslept on Monday morning (and missed my posting window at PopFi, but that’s another story). 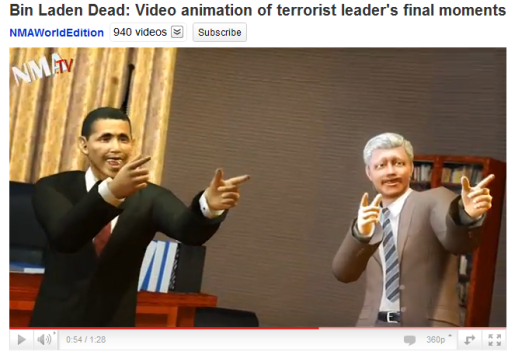 However, other news agencies didn’t oversleep, and one of those was the wonderful animators at NMA News, who had a ball with Osama Bin Laden’s death scene. Here’s NMA News’ take on Osama Bin Laden’s final moments. Warning: this is probably the funniest and least SFW NMA video ever. It’s incredible, isn’t it? The long hunt for the most-wanted terrorist in the world is finally over, and it was even live-tweeted as it happened. Fittingly, Twitter is also where the news broke officially, though it didn’t really happen until it was announced on television (and it may not even be real until picture evidence show up). If Osama is really dead, and I’m pretty sure he is, then terrorists worldwide have been dealt a serious blow.